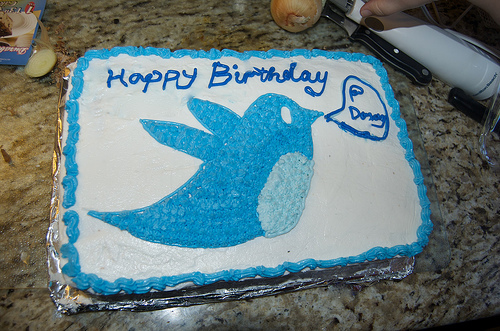 On Monday, March 21st, 2011, Twitter officially celebrated its fifth birthday. It has come a long way in the past five years, and now – since I think it’s old enough to handle it – here’s what I really think of the social media giant. 1. Just how simple it is. All you need is something to say, a computer or mobile device, and 140 characters – that’s it. 2. Real-time citizen journalism. News now breaks on Twitter: not the major newspapers or networks. The Miracle on the Hudson was first reported on Twitter and the first images appeared on Twitpic. I now look to Twitter for breaking news, and to traditional news outlets for analysis and in-depth investigation – a beautiful co-existence. 3. Listening. It’s the best online listening tool out there. When I’m teaching my students how to set up their Twitter accounts and begin tweeting, I tell them to spend 80% of their time listening and 20% tweeting. Once you know what’s being talked about, it’s much easier to join the conversation. With the proper tools, and a bit of know how, you can train Twitter to alert you whenever somebody is tweeting about your organization, blog, favourite fashion designer, or anything else you may want to keep track of. For example, I’ve set up TweetDeck to alert me if anybody tweets about my current employer, blog, twitter username, favourite sports teams, etc. 4. Instant crowd sourcing. 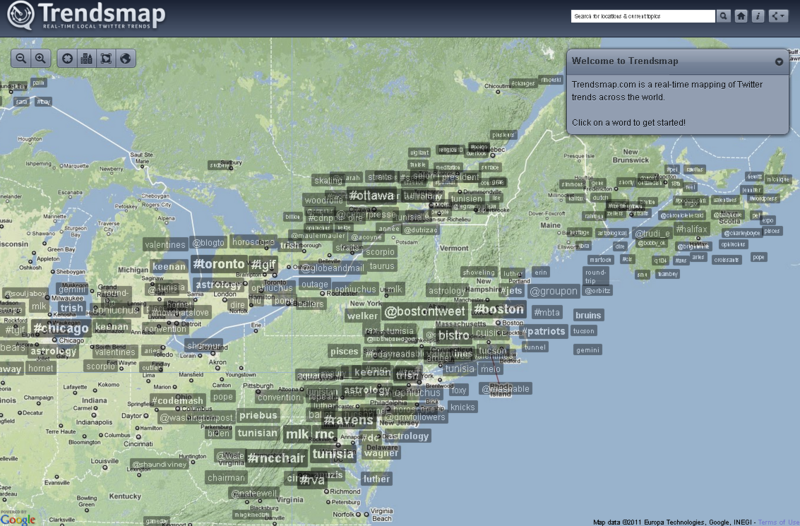 With tools like TrendsMap, Twitter lets you instantly check in on what’s being discussed in your city, country, and around the world. Events like the World Cup, natural disasters, or even national holidays can be seen trending based on region in real-time. I’ve even used Twitter to increase audience engagement at events. 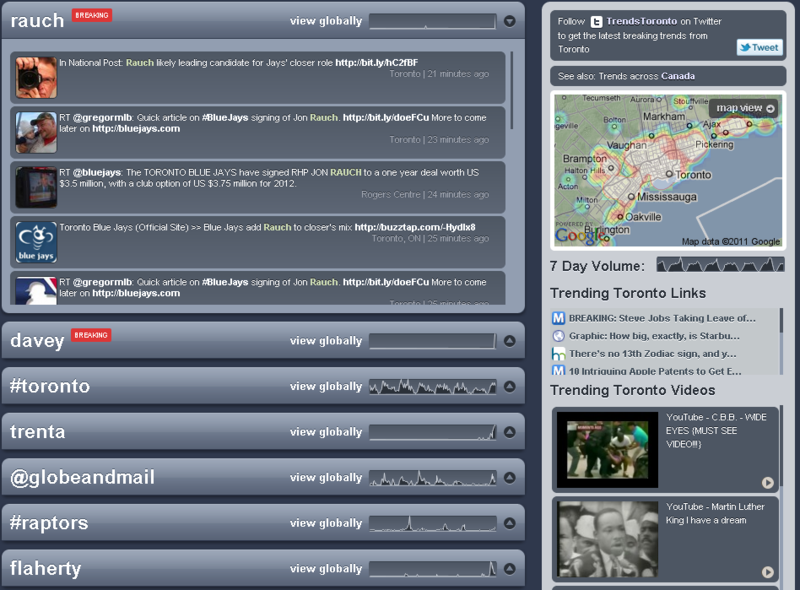 All we did was create a #hashtag unique to the event, encouraged people to use it, and displayed a tweet-wall throughout the day. We got feedback about the speeches, multimedia presentations, and even the food we served. Using TrendsMap I was able to see that our #hashtag was the third most popular in Ottawa that day – third to #Ottawa and #CDNpoli. 5. Driving web traffic. Twitter moves web traffic. Whether you are trying to build your personal brand, increase sales, or just share a flickr gallery with your family, Twitter gives you a fast, easy, and trackable way to drive people to your site. 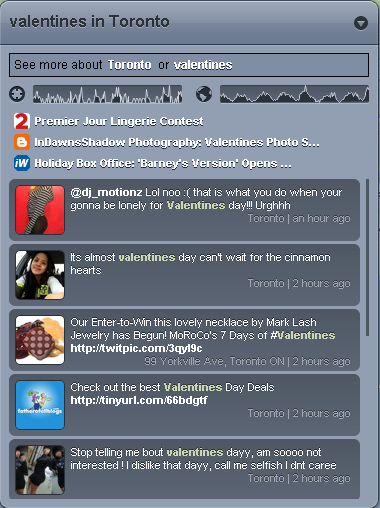 In fact, Twitter is the number one referral tool to my blog and many others. 1. Auto DMs and Replies. This is a big peeve of mine, which I will discuss in an upcoming post. I can’t stand it when I get an auto-DM thanking me for following someone on Twitter and having them now ask me to “like” them on facebook, or follow their blog, or donate to their cause. I just followed you on Twitter: let’s get to know each other, then maybe I’ll “like” you on Facebook. 2. Those third-party management tools that were great when they were free, now charge a monthly fee. You know who you are…For instance, now if you now want to use the enterprise-level version of Hootsuite they want $1,500 a month (or $18,000 a year) – a bit too steep for those of us who work in the not-for-profit sector. 3. 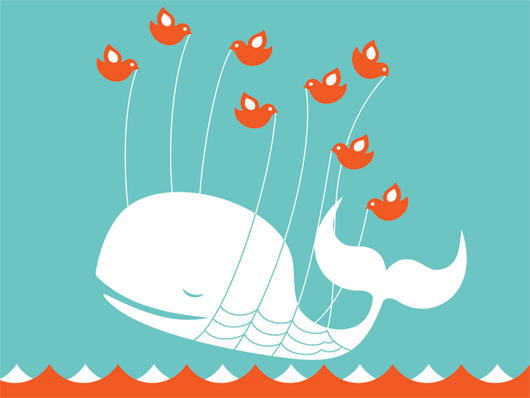 The fail whale. Yes I love the cute graphic, but can’t stand it when Twitter is overcapacity and I have to wait my turn to tweet or refresh my streams. Nobody likes it when they get an error message online, but it seems to happen to me on Twitter every week. Does this mean I’m using Twitter too much? Or is it a sign that Twitter needs to increase its bandwidth? 4. How addictive it is. Many days I can’t stop tweeting, retweeting, replying, and reading tweets. I only stop when my eyeballs start hurting or I go to bed. Dear Twitter, stop being so interesting and ubiquitous. Love, Dave. What do you love or hate about Twitter? Leave a comment and let me know.